I love the digital world. Not necessary the technical details, but the impact it has in consumer behaviors. Not for any other reason, I surely was one of the first consumers to have the iPhone and iPad in Europe. (Here you can see my TV Interview holding the first iPad in Spain- in Spanish, 00.55 min). I also love to read. Even though I like reading all those recent tech news from my favorite blogs and selected sources, I enjoy at most to read to in-depth, well researched articles. My favorite is the weekly german newspaper “Die Zeit”. News, once a week with great in-depth analysis. 5 EUR per week are more than worth it. I once wrote about the Dead of Print Media and things I would never do again, hence, I unconsciously downloaded the “Die Zeit” app for iPad and subscribe to it. What a pleasure. But despite all the excitement, after some few weeks, I cancelled my digital subscription and purchase the paper edition of it. Who would have believed that I was returning to the analog world? 1. To read the newspaper. Yes! no more Email checking in between, no facebooking, no annoying notifications nor interruptions of any kind. 2. To read the newspaper. 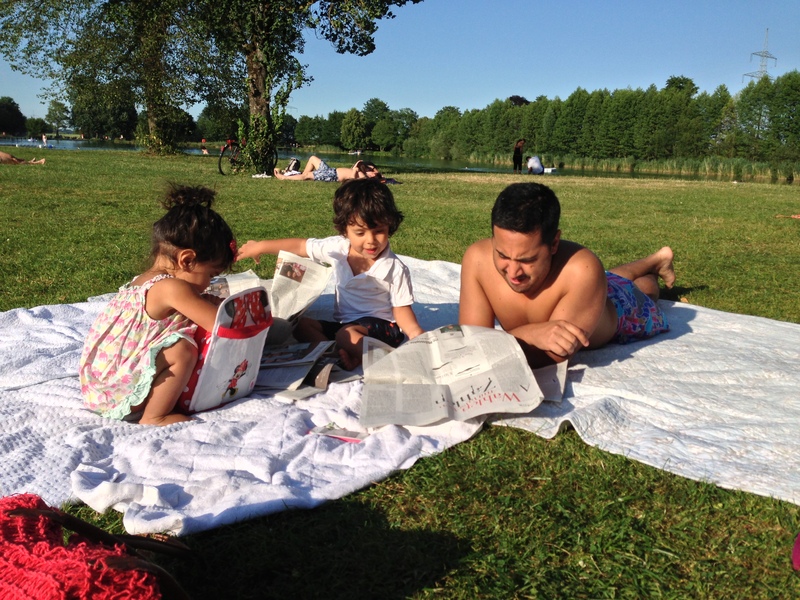 My 2 and 4 year old kids now know I am JUST READING THE NEWSPAPER! No, I AM NOT playing the new Batman Lego Game. I AM NOT watching Toy Story 3. No, you can not “WORK” with my iPad. My son “working” with my iPad. 3. To read the newspaper. I can finally read under full sunlight outside and enjoy my balcony. 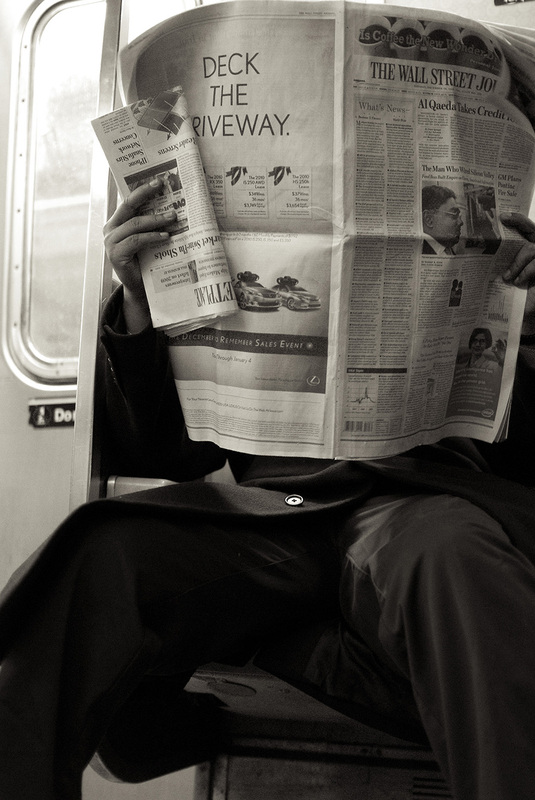 Thanks to the usual paper size of newspaper, it is a pleasure to open it and close your self out from the world. There is surely not an App for that! O boy was I a happy man. My kids got it, and were happy. My wife got it, and was happy. After just the fourth week of receiving my paper, things changed. 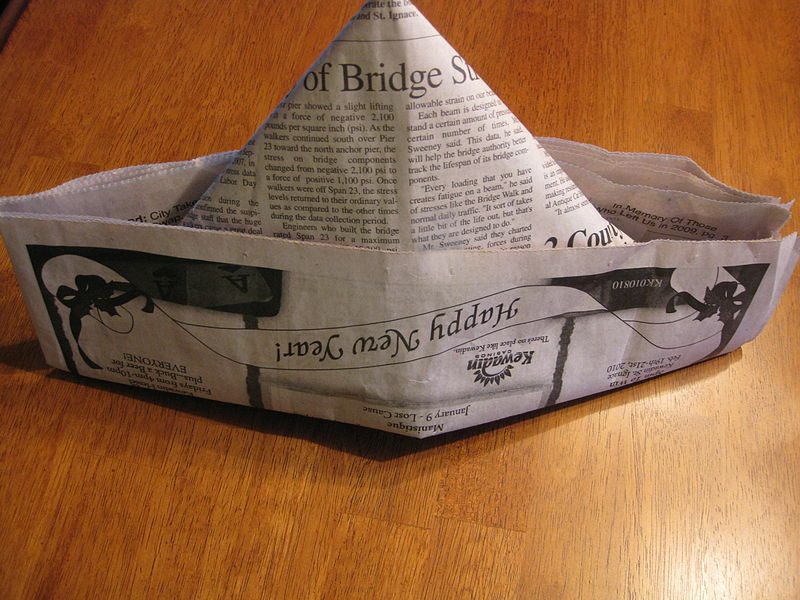 My kids creatively discovered that paper newspaper can be a tool for new interactive and physical games. They surely could see how happy I was with this analog tool, hence they imitated my behavior and stop playing with their iPad. Then it happened. That day of that week when I came home that afternoon anxious about reading my new newspaper, to my surprise, I discover every single page of the newspaper spread out through the entire apartment! 3/4 of the newspaper was either destroyed, wet (!?) or was simply unreadable. I managed to rescue one section of it. As soon I try to open it to activate my please-dont-disturbe-cause-I-am-reading mode, both of my kids took the paper out of my hands and start playing with it. This happened again and I surely did not have the patience to handle a paper newspaper as if it was an expensive digital gadget. I was also not in control, cause the newspaper arrived when I was not at home. Suddenly it came back to me why I unconsciously hated paper, why it was so inconvenient, so outdated. I knew I did not belong to his world and I stopped fooling my self. It was just a happy four week affair. Nothing else. I decided to cancel my paper newspaper subscription. My wife hated she was not able to see me while I was peacefully reading my newspaper anyway! Life pleasure was restored…or that i thought. Some months went by, and I came back to reading daily online blogs and start again getting frustrated because of the lack of peaceful-and-uninterrupted-in-depth-content-reading sessions. Same happen with my book reading habit. My magical iPad Mini was not that magical anymore – when not been in used by my kids – and it was clearly not offering the best solution for my precious new hobby: reading! But then it happened! The enlightenment happened when I discovered the Kindle after years of ignoring it. Why was I going to buy and carry yet another device? (and ofcourse one without the fruit logo on it!). I purchased the Kindle Paper White for about 100€ and got myself ANOTHER gadget. But my life changed! For good. I am now in my third testing week and not only I have read more books and Die Zeit articles as never before, but everybody in my house is happy! Now, when my curious kids try to reach my new reading gadget, the answer comes almost by itself “Hey, this is not an iPad! See? See! you can only see words and all is in black an white, go away!”. My kids did not heard that last phrase. They were already gone as soon as they saw all these boring words in this weird little screen. I was saved! I can even leave my Kindle on the table next to my bed and it will always be, intacted, waiting there for me until I arrive. Now my kids know I am JUST READING. My wife can now see me and know I COULD ONLY be reading. Life had a meaning again. My new dedicated gadget is not only the best format to perform the activity “to read” but is as convenient as my iPad. I can carry thousand of books and articles. I can browse and buy new books and newspaper from it. I can even do things that I can’t with my iPad like uninterrupted reading and I can now read at sunlight in my terrace as good as reading at night while everybody is sleeping. 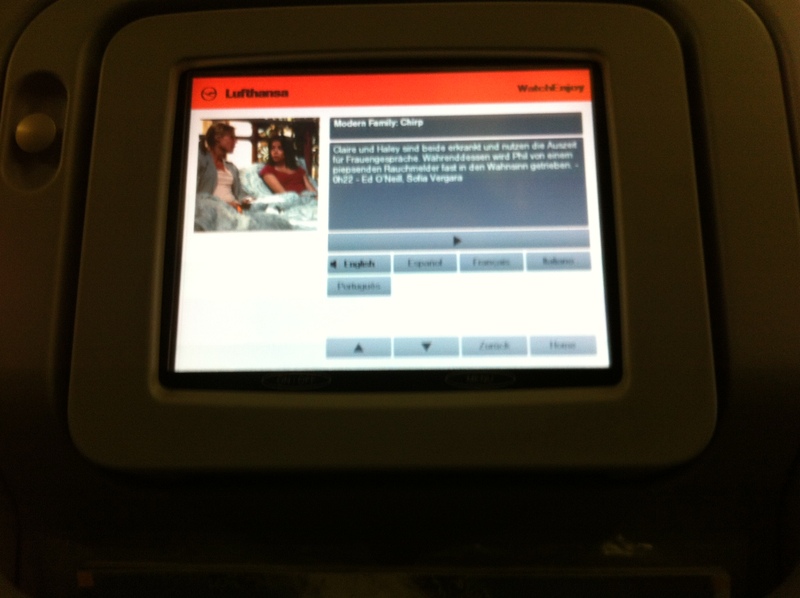 The reading e-ink screen is just better TO READ! Guaranteed! Its almost like reading from a real book! Because of the cross platform strategy from Amazon (well done!) I get my content sync to all of my other devices, hence I don’t need to carry another gadget with me. In case I have some minutes to read while waiting for my next dentist appointment, I can always continue reading exactly were I was left on on my iPhone. I am finally a happy man. I used not to get the Kindle. Why not an iPad an be able to do almost everything imaginable? Now I know. Focus. Having the power of a gadget capable of doing everything result on doing nothing 100% right. When my Kindle is in my hands, I just want and can read. 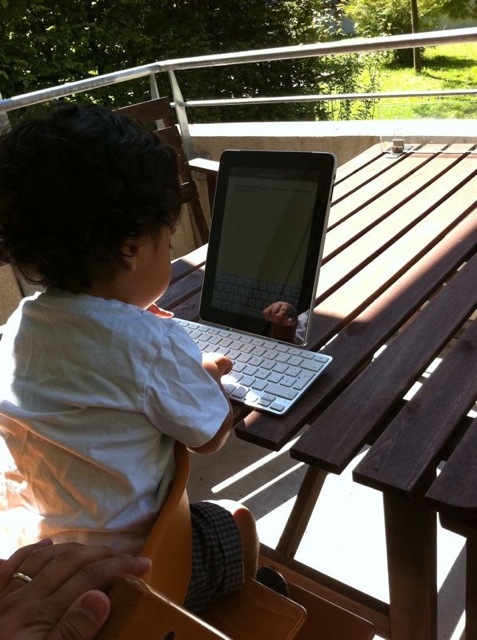 When I have mi iPad in my hands, well… I may be writing a blog or checking mail or chatting with someone. All good and I love I can do all that stuff in such an incredible and beautiful device. But when I just want to read, I just want to read. So if you read until here, because you wanted to know how to read a newspaper (or a book) when having small children, now you know. Get a Kindle! But, did I ditch analog media for good? Not at all! During all this time, I also discovered that the best medium to read a Magazine was still in paper. Neither the iPad nor the Kindle can provide me with the same experience. For this field, the only reason to change my habit will be to have a great interactive digital Magazine to play with. So far I been disappointed by all Magazines I have tested. But there is hope! I am currently testing the new and interactive iPad App from Axel Springer “EPOS”. It is still to soon to tell, but Magazines may be about to change… again. It is now more than 4 months since I got my iPad and it has been a wonderful experience so far. If I used my laptop 40% and my smartphone 60% during a normal day, now, with my iPad, I am using my laptop 20%, my smartphone 50% and the rest (30%) goes for the iPad. – watching videos in YouTube, podcast, or rented/purchased videos from iTunes. Still, the iPad is yet not for super users and probably will never be. Enrique Dans mentioned some good arguments which I completely agree. Most of the reasons are still due the obvious iPad limitations like no multitasking and no printing. But many of these will be addressed with the software update iOS 4.2 in November. And lets face it, there will always be phisical limitations for higher performance activities like those done while sitting for 8 hours in an office! I think I agree with the analogy that Steve Jobs did during the D8 Conference, where he compares desktops and laptops in the future to be like trucks and tablets like cars. Trucks will always be needed, specially for heavy duty tasks, but for the rest, tablets like the iPad will be the gadget to use. With the iPad I can enjoy all those activities which are quite inconvenient to do on a laptop, plus, I don’t need to carry cables with me, no extra battery (actually not even worry about battery life throughout the day) and best of all, it does not heat on my lap! (or hands!) and doesn’t makes sound! With the iPad I can enjoy doing things I couldn’t do before and there is no week that goes by without finding a new App that changes the way I do certain things, or better, do things in a more convenient and productive way (taking handwritten audio-notes sync with dropbox for example). 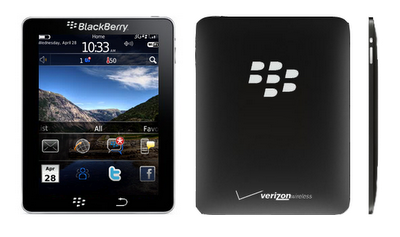 2010 was the year of the tablet, even though the iPad has been the only one to arrive the market sofar. 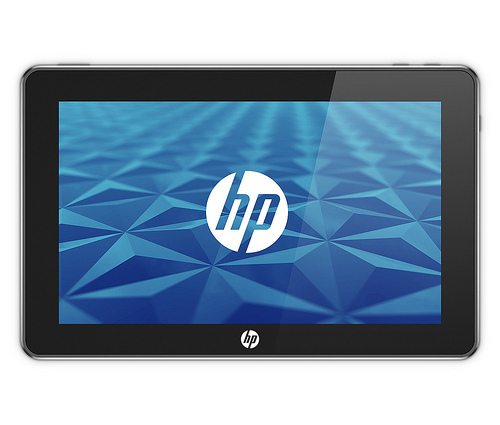 2011 will definitively be interesting with Blackberry Playbook, Samsungs Galaxy and the rest to appear from HP, Microsoft, etc. 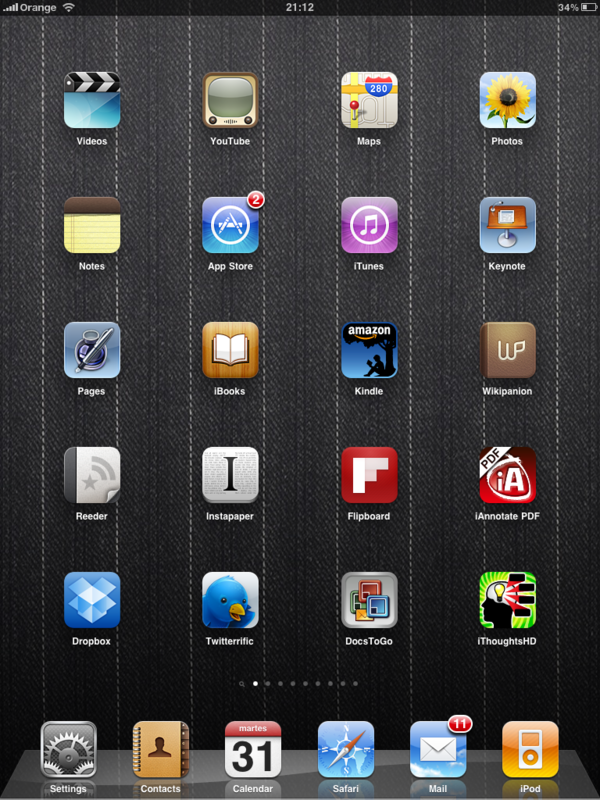 Having more and better tablets will make my future iPad even better, just as it happend with the iPhone. Due Apple’s philosophy of doing certain things right, rather than many things wrong, I am confident that there will be no Killer iPad for the next years. So, once again, those iPad skeptics were wrong! As Steve Jobs said on the D8, consumer goods are fascinating because they are the ones that choose what to or not to buy (not like enterprises, where decisions are taken somewhere and sometimes by old fashion IT managers who are experts on making the wrong decisions). The iPad has been selling like crazy, so Apple most have done something right. Ps: this post was written from my iPad, reviewed from my smartphone and shortly edited (links) from my laptop. 1. Flipboard (Free): This is without doubt the iPad killer app! Your Flipboard is a fast, beautiful way to flip through news, photos and updates your friends are sharing on Facebook and Twitter. And it’s an incredible place to discover fresh content from around the Twittersphere. Flipboard is the world’s first social magazine! Watch video. 2. Reeder (3,99€): Best RSS reader out there! It syncs with your Google RSS account! 3. Instpaper (3,99€): Best way to saved web pages for later offline reading, optimized for readability on your iPads screen. Visit http://www.instpaper.com to open a FREE account. 4. Dropbox (Free): Keep all your files in the Cloud that you want to have access from anywhere, anytime! 5. iAnnotate (7,99€): iAnnotate is both an elegant PDF reader and a powerful annotation tool that finally lets you work with your PDFs. You can open documents from email, sign and send out contracts, enter notes for edits, sketch diagrams, copy text, and add highlights or underline with the drag of a finger! 8. Pages (7,99€): Pages is the App I use to talk notes. I can edit from here like a normal processor. If you have the iPad Dock with Keyboard, you are going to love writing in Pages. Pages can open and export .doc documents! 9. Keynote (7,99€): Great app interface! You can really make a professional presentation with this App (much better than using Powerpoint!). Keynote can upon powerpoint presentations. Unfortunately, it can not export to powerpoint yet…only to PDF. 10. Wikipanion (Free): Great to search content in Wikipedia. You can save articles as bookmarks and create folders to organize your search content. I am testing also Discover (Free) which are great Apps to read Wikipedia articles, but somehow Wikipanion is still my best choice. 11. DocstoGo (11,99€): Access to all you Microsoft Files and be able to edit them! You can link your account with Dropbox, so all your docs will be update! Now you see why you don’t need an USB port? There is an alternative to this App which is looks much better (which I haven’t tested yet) called Quickoffice (1,99€). 12. Twitterrific (Free): This a great Twitter App to manage what you follow and see all your Tweets. UPDATE (2.09.2010): today was released the official Twitter app for iPad. This App is great and has already replace Twitterrific from my main homepage! Twitter for iPad is a MOST HAVE app! 13. iThoughts HD (5,99€): Great App to draw Mindmaps. This can be accessed and uploaded to a dropbox account. Can also export to PDF, mindjet manager and other formats! I am sure you will find some of this useful. Let me know which is your favorite Apps! I will soon post my favorite Games and Magazines/Newspaper for iPad. So, keep posted! For any question don’t hesitate to contact me. 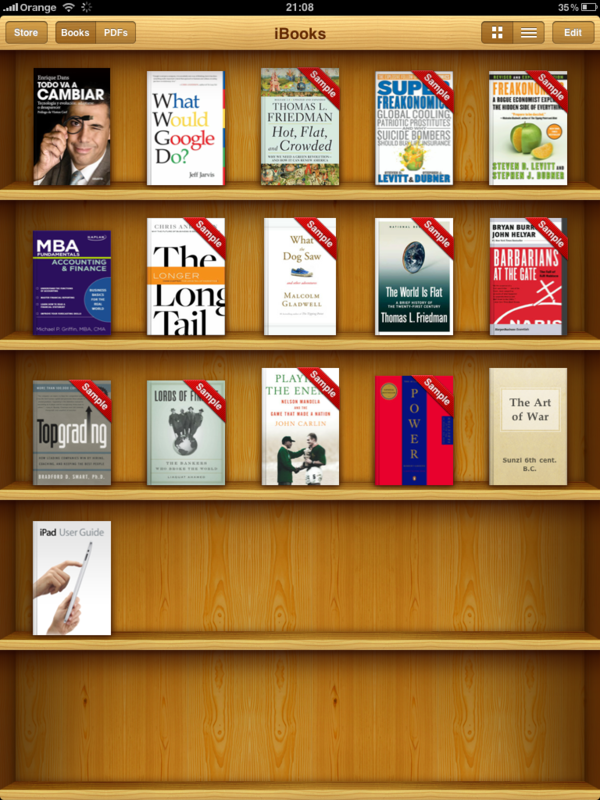 I just finished reading my first “digital” book (To Big To Fail from Andrew Ross Sorkin) using the Kindle App for iPad and iPhone. The experience was delightful. I was using my iPhone in the Bus and sitting on a bench outside Zara, Mango, etc while my wife was shopping. My iPad was meant for reading back home, at school (during break) and sometimes from Parque del Retiro. Independent the time, location and/or device, I was always brought to the latest page read and all my bookmarks, notes and highlights were always there. 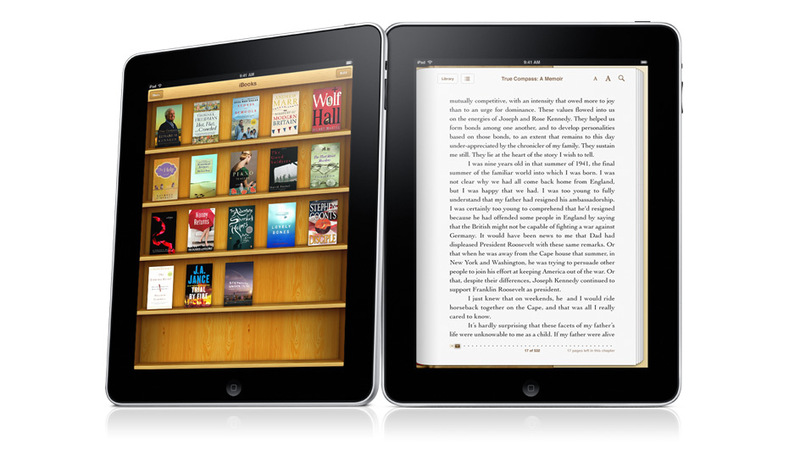 Digital Books, which already outsold printed books at Amazon.com last quarter, will soon be the standard format. I am sure I will also be telling my grandkids about this thing called “print books”. Convenience. 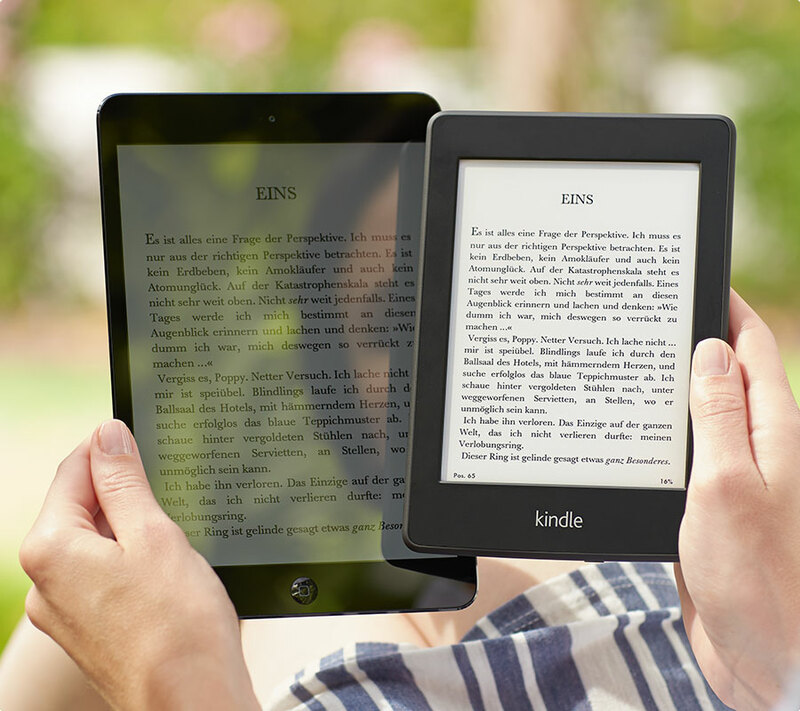 Read any time, anywhere from any device and bring all your book collection with you. 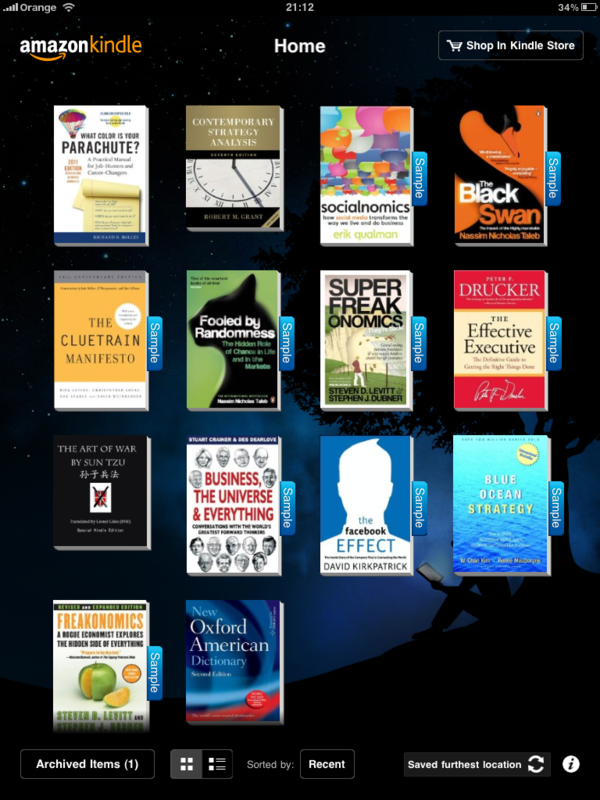 Download sample of future books to read and get personalized recommendations. Bookmark, highlight, make notes and instantly access to dictionary and search…yes, search within the book or with Google or Wikipedia from the book. Reading becomes Social. Now with the Kindle App you can even see which parts of the book have been highlighted by other readers. This is really interesting, cause the Kindle App just slightly mark you the most popular highlights. I was never an active book reader. But having this two advantages have made me want to read more and more. I no longer have to go to a library and wonder what to read next. I can now download books sample on the go whenever I get a good book recommendation or advice. Reading is now my main activity for any idle time on my day. I am now reading What Would Google Do by Jeff Jarvis from the iBook App for iPhone and iPad and will see if it can beat the Kindle App experience. For all those iPad skeptics! A frequent question I have received in the last week was: what is the added value compared to the iPhone or the iPod touch? 1. Screen Size! it does matter! what you are able to do with this huge and gorgeous display is amazing! 2. Battery life! 10 hours watching video or surfing the net? this is impressive! I start the day at 9am and for 1am I am still with 20% battery on my iPad. NO MORE cables! and 3. Speed! incredible fast and responsive. Amazing, even for productivity tools like keynote, pages, pdf editing, etc. Still not convinced! here my insights for the frequent concerns of any iPad- skeptic. 1. 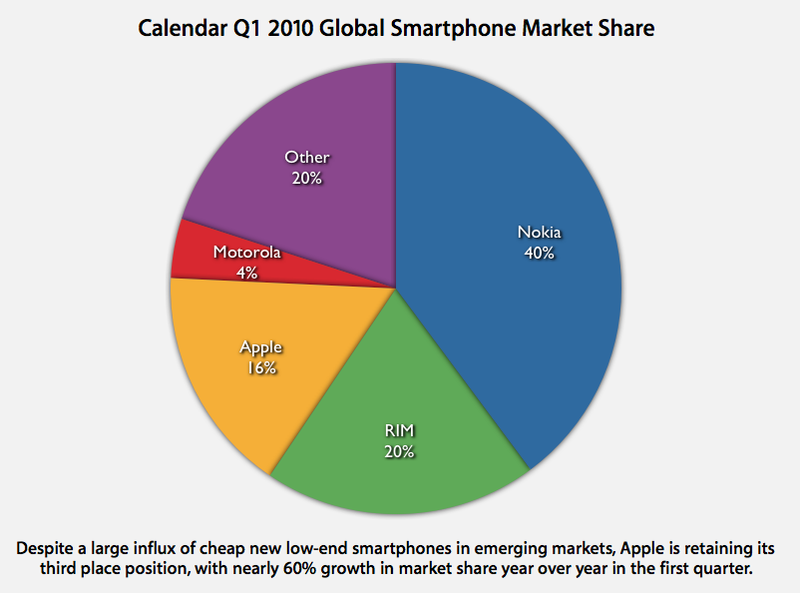 Fact: The iPhone revolutionized the Mobile Phone industry. It sold 1 million unit in 74 days. 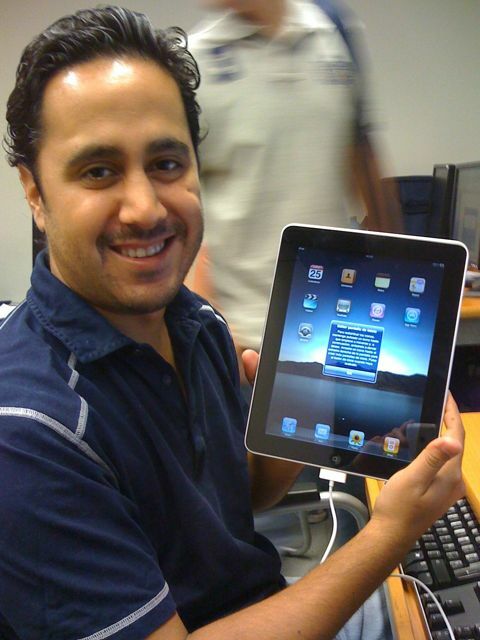 The iPad has sold 2 million in just 60 days. 3. The iPad is not a laptop substitute, but a complement. Laptops (which will eventually substitute Desktops) will be your mobile computer for your office/home or anywhere you spend bunch of hours working. If you want to be really mobile, the iPad (or any tablet equivalent) is the mobile device for the road, because a) you don’t need cables, b) no worries about data loss (iPad is synchronized and backup via iTunes and can remotely be wiped out), c) battery will get you through an entire day of productivity and/or entertainment, d) its ultra light (650 gram) and e) doesn’t heat in your lap! 4. 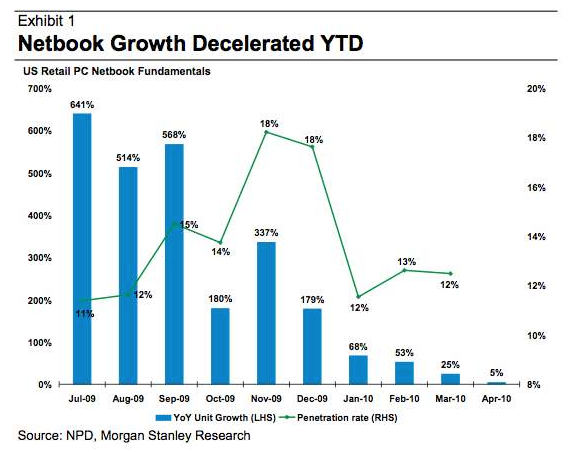 The iPad (and its equivalents to arrive from Google, RIM, etc) will kill the notebook market. “The problem with netbooks is that they are better at nothing!” Steve Jobs. Oh yes, we all criticize Apple for the needless products they make, but still everybody follows them. And I am the crazy one? or just a simple early adopter? 6. only 16-64GB? Please understand that when you are on the go, you don’t need ALL your 10000000 Songs/Videos/Files to move around with you, you just need to sync the data you need and that’s it. Need access to all your files? have you heard about “cloud computing”? Does “Dropbox” ring any bell to you? 7. Apple claims the iPad is the best experience (at least when you are on the go) for web browsing (forget about Flash), E-Mail, watching Movies and Videos, viewing photos, reading books, etc. And when installing some of the many thousand Apps for the iPad, you could do actually much more. Still doubts? Let me know them and will be more than happy to discuss them. You are currently browsing entries tagged with iPad at Guerson Meyer's Blog.